The author of the Combat Sanshou series (Combat Sanshou Part 1, Combat Sanshou Part 2 & Combat Sanshou Part 3), master martial scientist Wim Demeere, introduces a new curriculum into his training program, with different techniques geared specifically for heavy or lightweight fighters. Tiger and Snake is not a separate system and does not refer to the Tiger and Snake styles of Chinese martial arts, although there are similarities. This new program consists of new material added to enhance and broaden his existing Combat Sanshou curriculum. In Tiger and Snake, Demeere shows you how to mix tactics and mindset to maximize results. Tiger techniques develop power and strength, and are geared for big, strong fighters who are capable of powerful offensive strikes that will overpower an attacker and crush his will to fight. Snake techniques promote speed and precision, and are intended for small, fast guys who can channel their mean, vicious mindset to take down vulnerable targets quickly and decisively. 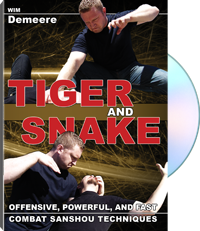 From Tiger's mindset of crushing, gripping, pushing, twisting, and pulling to Snake's mindset of evading, redirecting, circling, whipping, and snapping, Demeere adapts his bodyweight to execute both styles and mixes them to demonstrate the effectiveness of both. After viewing the video, you can adapt the lessons to your specific body type. If you are big and strong, be a Tiger and exploit your power. If you are light and quick, be a Snake and strike fast and viciously. For information purposes only.